Made with locally grown NON-GMO corn! Click here to read more about our local corn harvest season. If you fancy yourself a connoisseur of all-things-whiskey, think again. For the first time since Prohibition, you’ll soon be able to (legally) settle into a glass of true-blue, or should I say clear, West Virginia Moonshine. Listen. This ain’t your college bathtub juice. 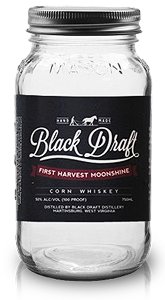 Our First Harvest Moonshine is an honest-to-goodness West Virginia unaged corn whiskey made in the heart of bootlegging country. We’re in the Shenandoah Valley, right in the foothills of the Appalachian mountains. And by incorporating local products, we create a truly authentic, pure, and tasty libation. Available in 375ml”pint” or 750ml “fifth” sizes.